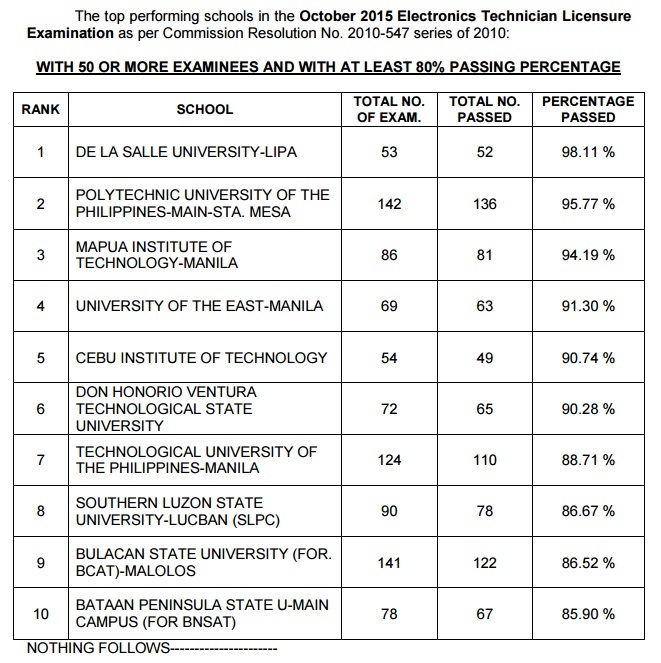 The Professional Regulation Commission (PRC) named University of the Philippines (UP) - Diliman as the only top performing school in the October 2015 Electronics Engineer (ECE) board exam as per Commission Resolution No. 2010-547 series of 2010. UPD got 40 out of 46 or 86.96 passing percentage. PRC on Thursday announced that 1,784 out of 4,467 (39.94%) passed the Electronics Engineer (ECE) board exam and 2,984 out of 3,518 (84.82%) passed the Electronics Technician (ECT) board exam given by the Board of Electronics Engineering in the cities of Manila, Baguio, Cebu, Davao and Lucena.